About: Craft beer, a lovely swimming pool, and even clean sheets, El Vado has come a long way, baby. Photographs by Jakob Schiller. 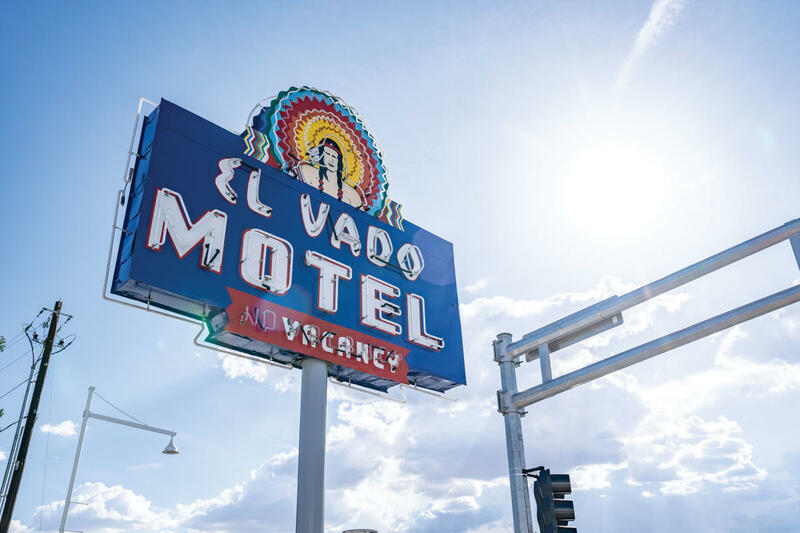 Travel back to the glory days of Route 66 with a stay at the restored and reimagined El Vado Auto Court, in Albuquerque. Rescued from demolition after sitting vacant for a decade, the 1937 neon treasure once again gleams after a careful makeover that preserves Pueblo Revival details like gently sloping adobe walls, thick vigas, and the original signage. The motel reopened in July as a boutique hotel, with 32 retro-luxe rooms starting at $131, plus a new pool and event center. At the front of the property, El Vado Plaza invites guests and the public to grab a meal from one of the “food pods,” including Zendo Coffee, Sandia Crust Pizza, and Bosque Burger. El Vado taproom pours cold pints in the beautifully redone former motel lobby, and micro-retail shops sell local food products, jewelry, and gifts. It’s a far cry from 1937, when the motel opened and took advantage of the realignment of Route 66 east–west through the city. El Vado’s bright neon sign beckoned weary travelers to pull off the newly paved Route 66 and stop awhile, nestle the Buick into a shady carport, snuggle in for a good night’s sleep in one of its 32 rooms, and fill up at its gas station before hitting the road again. Sadly, the years were not kind to El Vado. 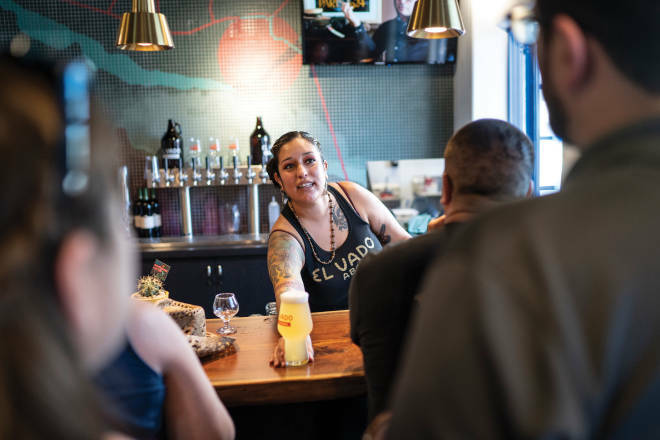 The project’s Portland-based developer (coincidentally, the owner of Albuquerque’s nearby Ponderosa Brewery) went to great pains to preserve its vintage appeal, and El Vado returns as a traveler’s oasis. Read more: Red River&apos;s new family-owned brewery.